Seventeen students competed at the Worldwide Youth in Science and Engineering (WYSE) regional on February 7 under the guidance of moderator Mr. Scott Timmermann. We congratulate our students who advanced to the sectional competition at McKendree University on March 13: Annie Kuenstler – 1st place in English, Amber Litteken – 2nd place in English, Ben Logullo – 2nd place in Biology, and Sarah Maller – 2nd place in Mathematics. 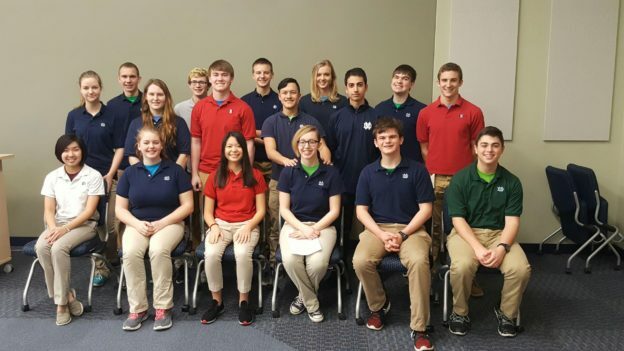 left to right: (front) Annie Kuenstler, Maria Kreke, Minh Le, Amber Litteken, Ben Logullo, Will Harad; (middle) Katie Goring, Sarah Maller, Trever Johnson, Alex Rivera, Diego Arroyo, Otto Stark; (back) Ethan Schumacher, Keegan Spirek, Nick Toennies, Sarah Schriewer and Brett Kaufman.